A conversation with Baidik Bhattacharya about post-colonial writing, left copy reading and the past and future of world literature. 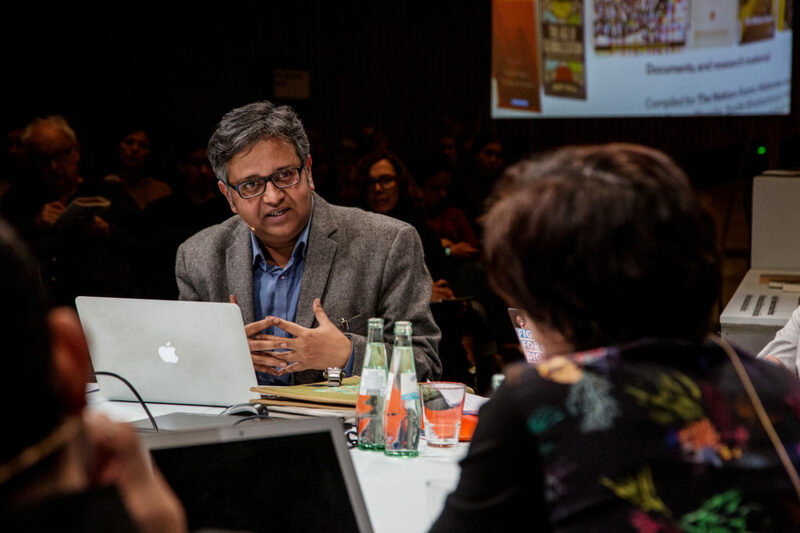 On the occasion of the international conference Dangerous Conjunctures at Haus der Kulturen der Welt in Berlin, Sophia Lohmann spoke with Baidik Bhattacharya, Assistant Professor of English Literature at the University of Delhi and editor of The Post-Colonial Gramsci, about literature and its research in colonial and post-colonial times, the influence of globalization on texts and guerrilla reading in India. Sophia Lohmann: As assistant professor of English literature at the University of Delhi you have a major focus on postcolonial writing. What role does English literature have in the Indian society and do you consider it problematic due to its entanglement in the violent history of colonialism in India? Baidik Bhattacharya: If we think historically about the status of English literature in India one should read Gauri Viswanathan’s book Masks of Conquest. Literary Study and British Rule in India. She shows that English literature as a discipline was invented in India, not in England. Indian universities offered English literature as a taught course from early 19th century onwards, prior to the universities in England. Hence, English literature as a disciplinary formation has its roots in colonialism and was partly related to the so-called civilizing mission, the idea that the colonizer is civilizationally superior and therefore meant to force their culture on the colonized people. One of the ways of proving this alleged superiority were English literary texts. This position was advocated by the Anglicists who suggested that in order to civilize India one needs to introduce European curricula and particularly English literature, while the so-called Orientalists suggested that the Indian education system should be rooted in Indian literature traditions. The battle was won by the Anglicists, as a result of which we have from that point in time English literature as a taught courses in India. English literature as a discipline was invented in India, not in England. In more recent contexts we observe a different tendency: departments of English literature have partially and unofficially metamorphosed into departments of comparative literature. In contrast to typical English departments they do not only teach canonical English texts but also a range of texts which are translated into English from other European languages but also from various Indian languages. Due to the multiplicity of languages in India most courses on literature from India work also with English translations, what allows us to access a rich tradition of Indian literature of which Tamil, Hindi or Bengali are only a few. Sophia Lohmann: Does Indian literature have a major role in the broader society in India? Baidik Bhattacharya: Yes, in a variety of languages. After the introduction of print technology in late 18th century different markets have evolved in their own ways and we now have several thriving markets: In Kerrala mostly for Malayalam literature, in Eastern India for Bengali, in Western India for literature in Marathi etc. These languages and literatures not just have a rich tradition but are much more popular than their English counterpart because only a minor percentage of the Indian population can read literary texts in English. So, people mostly access literature in their own languages which are a lot: Already in the famous Linguistic Survey of India from early 19th century they counted 179 languages and 544 dialects in India. Sophia Lohmann: The term and concept of ‘world literature’ is a highly ambivalent one, going back to imperialist and paternalistic imaginations and practices. However, we are observing a rehabilitation or at least reconsideration of the concept, brought forward by David Damrosch, Franco Moretti, Gayatri Spivak, Pascale Casanova and others. What is your opinion on the return of the concept and do you see possibilities to de-colonize it? Baidik Bhattacharya: The idea of world literature is a 19th century concept, prominently appearing in Goethe’s work in 1827 and afterwards in Marx and Engel’s Communist Manifesto. Today, there are different positions: Franco Moretti argues that World literature is one of the theoretical concepts that respond adequately to the challenges of globalization. But at the same time, thinkers like Moretti or especially Pascale Casanova suggest that world literature as a theoretical concept has to be recuperated in explicit opposition to post-colonial studies which had unnecessarily politicized the concept. Aamir R. Mufti, Emily Apter, Gayatri Spivak or I myself, on the contrary, try to show that the idea of world literature is clearly anchored in the structure of the empire and implies and depends on a certain, problematic conceptualisation of the world. When Goethe said that we are entering an era of world literature, the context was an imperial conjunction: All the texts he referred to, Chinese and Sanskrit literature for example, were translated by colonial administrators, then reaching Europe primarily through English, later being translated into German and other languages. Colonial administrators had to learn a different language and some even produced grammars that were standard text books for coming colonial administrators. These practices of learning and appropriating new languages in the process of colonisation faded in the ambitious project of world literature. I think we can recuperate the concept but we should always think of its actual colonial archive and be more critical than many scholars are today. Sophia Lohmann: Could there be a reinvention of the concept of world literature in the sense that we read and promote works of literature that are ‘worldly’? That show the world in an unfamiliar, maybe critical way from perspectives differing from dominant world views and still not walking into the trap of representation? Baidik Bhattacharya: We could definitely understand post-colonial literature as worldly or world literature, especially texts written in languages other than English. I stress the point of non-English writing because language is a world-making instrument. We produce a world through language but also many languages have been appropriated or vernacularized. In India, English has become a vernacular language through its presence for many centuries. If someone in India is writing in Bengali, this is rarely done in linguistic isolation, because most authors also know and read English. Their world-making process presupposes the knowledge of other languages and results in various connections they make across different languages. This ghostly presence of other languages is a worldly and global practice which can be observed not just in India, but also in Africa, South America and many other parts of the world. Sophia Lohmann: What role does global capitalism and the increasing production and distribution of literature along market lines mean for the present and future of literature? Do you consider a further standardization of texts–rooted in political and cultural power structures–likely? Baidik Bhattacharya: Indeed there is a new trend of standardization of texts. Rebecca Walkowitz introduced the theory of being “born translated”, meaning that certain literary texts are written to be translated in other languages and then be available to a global middle class. Being conscious of this economy changes the moment of writing completely: One tries to exclude everything that does not make sense in other languages or contexts. So even if a book is located in a particular geographical and cultural context, it will be written in a language that will be accessible to a non-immediate readership that is supposed to be a well consuming one. Sophia Lohmann: Do you also see positive effects of globalization in the context of world literature, for example that more people have access to texts from all over the world? Baidik Bhattacharya: Yes, the internet has an enormously important role because of the great amount of texts one can access through open source sites and libraries and the internationalization of the realm of literature. The internet not just introduced a lot of options to access literature, but also changed our reading practices and the way we understand literature. Earlier we had a very intricate network of public libraries in India which been replaced by a virtual world of abundance, a limitless space. Also illegal sites that give you free access to copy right material have an important role, especially in a post-colonial condition like India where access and the resources are very limited, both in terms of infrastructure and money. In Indian universities you find several informal networks of students and faculty members who access texts that are stored on servers in countries where you do not have stringent copy right law. They download them and share them with their fellow students. We call this practice copy left. Sophia Lohmann: The Internationaler Literaturpreis also honours translations but often without being capable of reading the nominated books in the original language. What do you think about the current translation politics? How can we deal with the suspicion that translations can be an imperial practice or at least a process that is accompanied by a fair amount of loss and speculation because the idea of untranslatability is not very attractive for the international book market? Baidik Bhattacharya: On the one hand, one can argue that world literature is critically dependant on translation and translatability – that a text lends itself to translation. This means a translation between different languages, but the translation that is internal to the language is equally important. When the author V.S. Naipaul, who grew up in the Caribbean, migrated to England and writes in English, writes ‘garden’, he deals with two extremely different imaginations and notions: The English garden is central to English landscape and culture as a place of cultivation, culture and serenity. In Trinidad on the contrary, the garden is also associated with plantation, slave and child labour, a site of immense violence. How do you translate this notion into English which is not designed to capture a violent idea of garden? You are continuously struggling with the language. We should bear in mind that the practice of translation presupposes complete transparency and translatability between languages. Furthermore, most works are looked at in English translation what is another problematic aspect – it all gets translated into one language or is mediated by it and that belies the very idea of the world. The dominance of English is part of the historical legacy of the empire and English still appropriates and kills other languages. Sophia Lohmann: Could appendixes or untranslated passages be a fruitful way of dealing with moments of untranslatability? Baidik Bhattacharya: Yes, one example is Amitav Ghosh. He often describes a polyglot context and many of the words in his text remain untranslated and he is notviding a glossary at the end either. The challenge is to confront the heterogeneity of languages which is the reality of empire, even if the official version of British empire is English. It is a heterogenous space which is continuously being translated into a monolingual imperial archive. Sophia Lohmann: You co-edited the book The Post-colonial Gramsci that traces Gramsci’s impact on postcolonial studies, for example the work of Edward Said amongst other things. Could you trace the relevance of the italian thinker Gramsci for our today’s post-colonial condition on a global scale? Baidik Bhattacharya: The emergence of subaltern studies would not have been possible without Gramsci’s work. Most scholars of subaltern studies borrowed their ideas from him and our book gives an insight into this Gramscian structure of subaltern and post-colonial studies. At the same time, contributors like Partha Chatterjee, Gayatri Spivak, Sandro Mezzadra and others have their own approach to Gramsci in the context of their respective field. Besides, we could think about Italy as post-colonial space, particularly looking at Gramsci’s writing on what was known as the southern question. His description of the situation comes very close to colonial situations and we propose that Europe also went through some kind of post-colonial phase. Italy was our entry point, but this thought could be particularly applied to countries like England, France or Netherlands which had major empires in recent history. A post-colonial reading of Gramsci allows us to rethink European history.